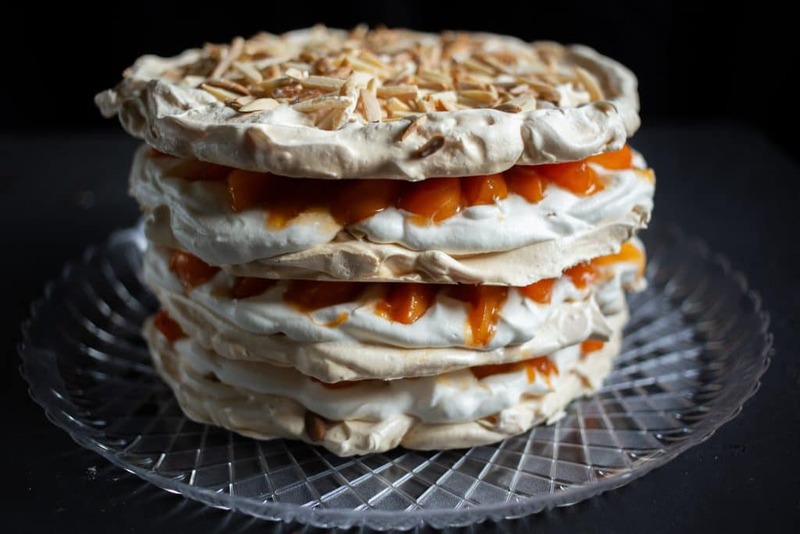 A recipe review for Apricot-Almond Meringue Cake from America’s Test Kitchen’s The Perfect Cake cookbook. 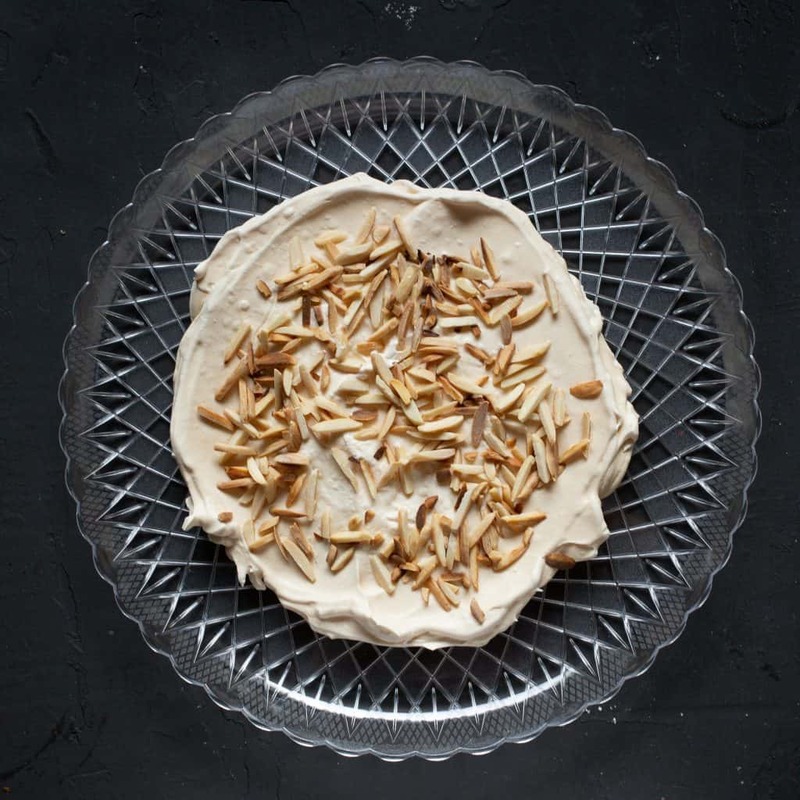 Fresh apricots and smooth whipped cream with crunchy almonds nestled in layers of meringue. [social_warfare]This post may contain affiliate links. See my disclosure policy here. I’ve loved baking ever since I was young, but I haven’t always been a successful baker. When I was little, my grandma would give my sisters and I free reign in the kitchen to make whatever we wanted. I remember combining all sorts of baking ingredients to try to cakes for a tea party, but they always turned out hard as a rock. I’d not yet learned the basics of leavening ingredients like baking powder and baking soda. Years later, I finally learned how to follow a cake recipe and even branched out a bit to make up my own small batch creations. I’ve come to love cupcakes and mini desserts because you can always test one first to find out if it is properly baked and tastes ok before you serve it to others. However, I’ve often shied away from layer cakes and other full size creations because they’re harder to test with new recipes and techniques. If you cut out a slice to test it, you’ve ruined the presentation of the finished product. 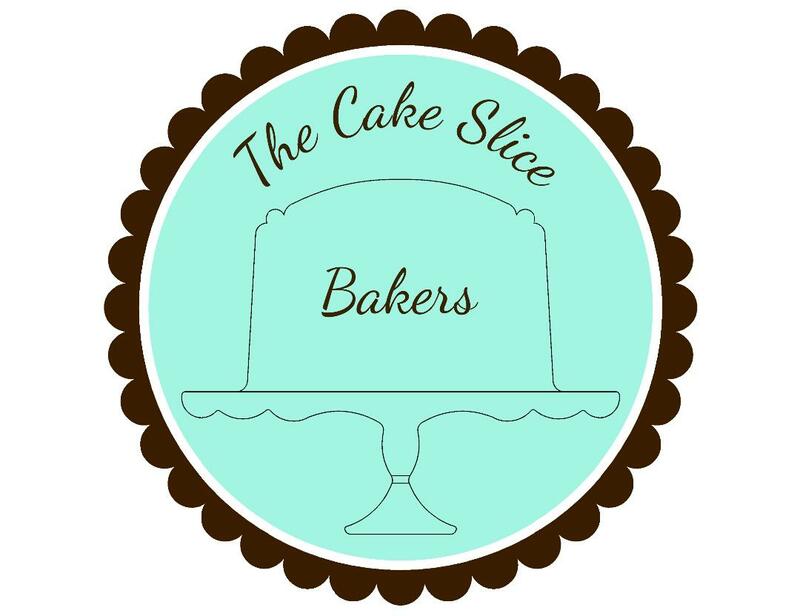 For this reason, I’ve always been in awe of this group called The Cake Slice Bakers. They’re food bloggers who bake their way through cake-inspired cookbooks and then share their results with the world. One of the first things did after starting my own blog was to ask to join group. I thought this would finally be the chance and challenge I needed to branch out of my comfort zone with more complex cakes I probably wouldn’t attempt on my own. 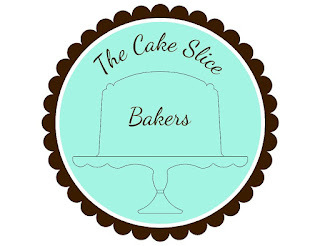 This is my first post with The Cake Slice Bakers and I couldn’t be more excited. Every month, the group chooses four cakes from a particular cookbook and we all pick one to bake. We’re baking from America’s Test Kitchen The Perfect Cake cookbook this year. I’ve been using America’s Test Kitchen resources for years and really appreciate their scientific approach to cooking and relatively foolproof recipes. This cookbook did not disappoint. 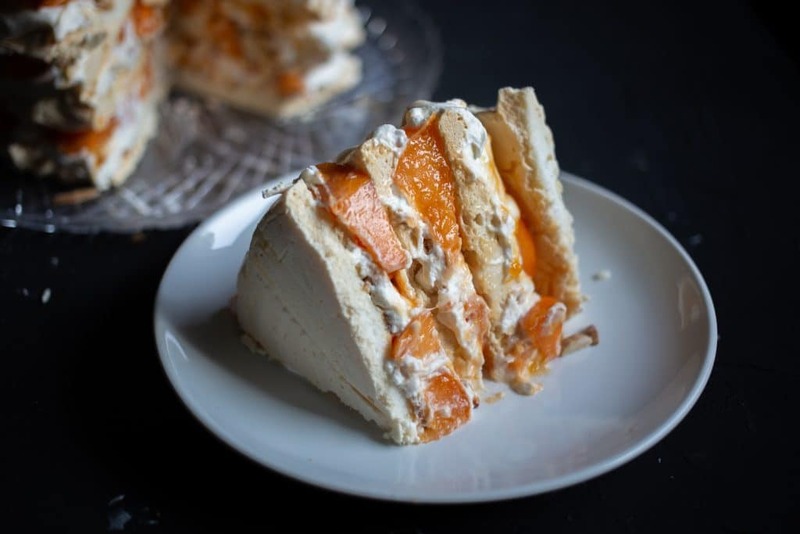 Since I’ve joined this group as a personal challenge, I chose the cake that sounded the most intimidating to me: Apricot-Almond Meringue Cake. 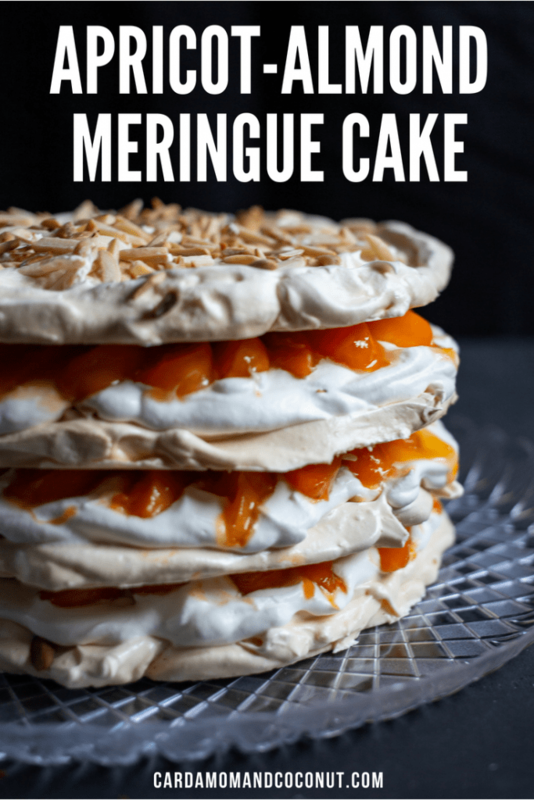 I’ve never made meringue before, so to make four layers of meringue and combine into a cake? I had very little faith in my abilities, but the recipe made each step simple, so it was actually quite successful. To make this cake, start by tracing four 8-inch round shapes onto parchment paper and put the parchment paper on baking sheets. Then make a simple meringue, divide it between the circles you traced and spread it out to fill up the circles. Sprinkle with sliced almonds and bake at a low heat for a surprisingly long time. When the oven timer goes off, turn off the oven and let them sit in there for another hour. This was the hardest part for me – waiting for them to finish baking and cooling without peeking. My oven light is out, and opening the oven to check their progress could have ruined them. While letting cool in the oven, whip some heavy cream and slice apricots and combine them with a simple glaze. The final step is to combine everything everything. 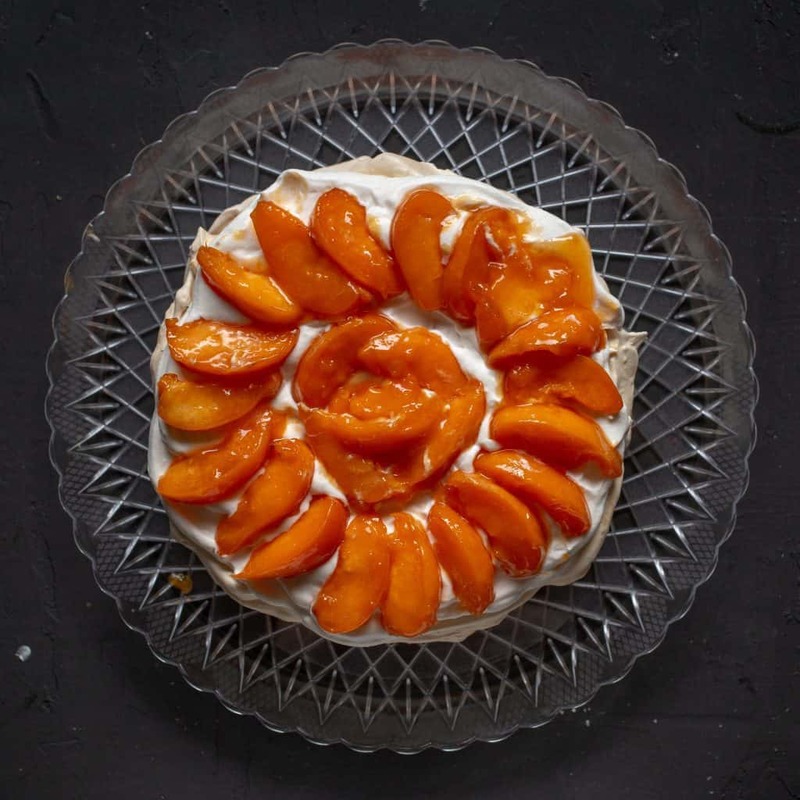 Place one of the meringue rounds on a large plate, top with some whipped cream and then the apricots. Repeat for the rest of the layers. What I thought sounds like an intimidating recipe was surprisingly easy thanks to great step-by-step directions in the cookbook. The meringue turned out perfectly and the apricots were so fresh and tasty. The only downside to this recipe is that it cannot be made ahead – you need to make and assemble shortly before you plan to serve. I tried saving some slices for leftovers, but the meringue pretty much dissolved, so the crunchy creamy texture balance was gone by the next day. I’m a lot more confident with meringue now, so I may try different variations on meringue layer cakes in the future! For the recipe, look for The Perfect Cakes Cookbook on Amazon here or find at your local library. If you enjoy to bake, this will definitely become a favorite cookbook. 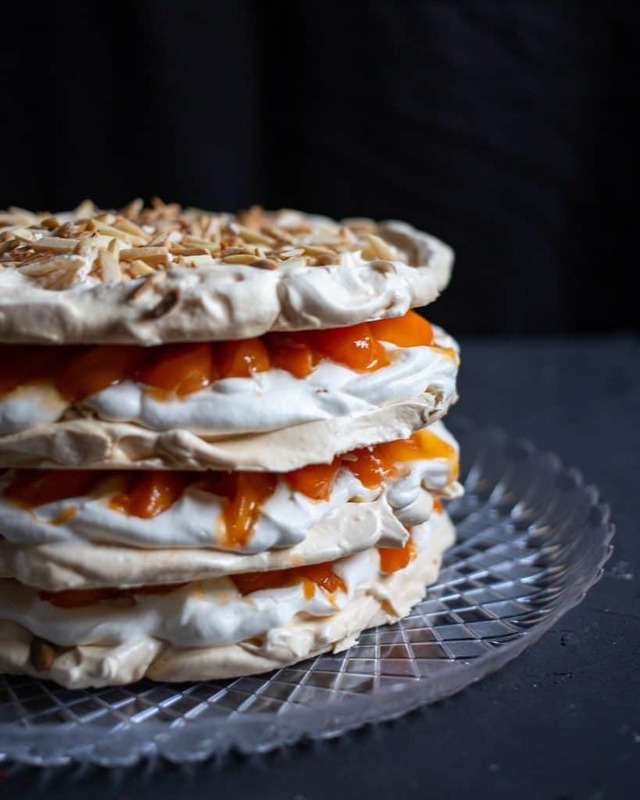 If you enjoyed this recipe review for Apricot-Almond Meringue Cake from The Perfect Cake cookbook or if you’ve tried anything else from their cookbook, please comment below and let me know! Each month The Cake Slice Bakers are offered a selection of cakes from the current book we are baking through. This year it’s The Perfect Cake from America’s Test Kitchen #atkcake. We each choose one cake to bake, and then on the 20th – never before – we all post about our cake on our blogs. There are a few rules that we follow, but the most important ones are to have fun and enjoy baking & eating cakes! The choices this month were Lemon-Buttermilk Sheet Cake, Apricot-Almond Meringue Cake, Refined Strawberry Shortcake, and Party Cake Pops. Everything about this delicious cake…YES!!!! So delicious! This is perfection! 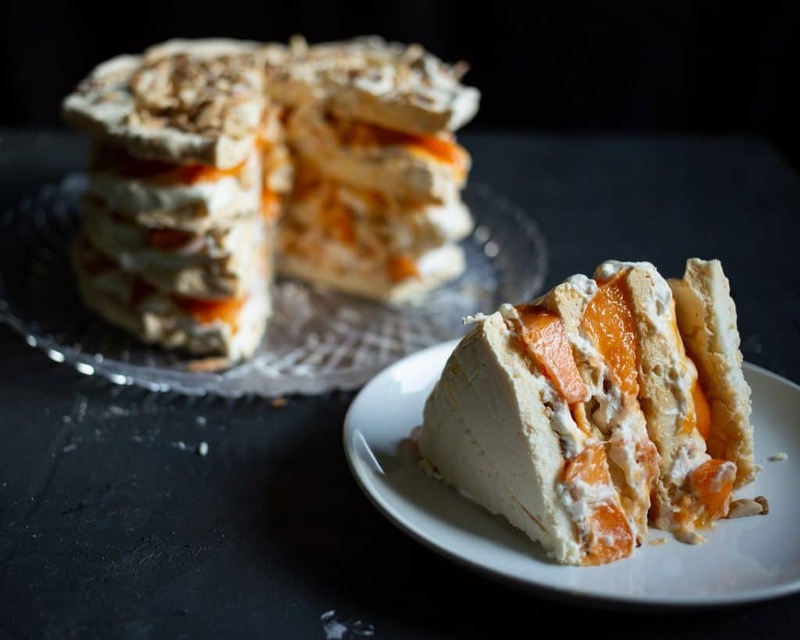 Love all the layers of crispy meringue and delicious apricots! You know what? I don’t enjoy apricots enough! I can’t wait to make this beautiful cake to enjoy! This is a showstopping dessert! Love those gorgeous and delicious layers! What a beautiful cake! 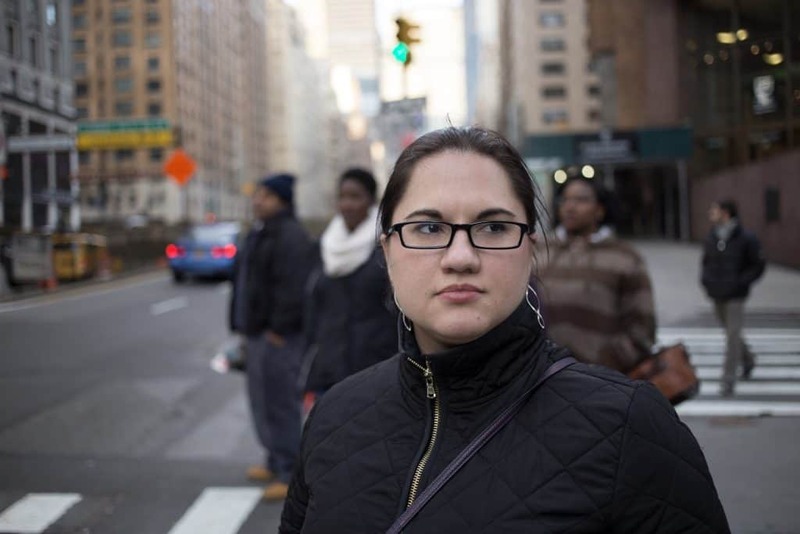 This one intimidated me too. Such a shame that you can’t make it ahead! What a beautiful cake! You definitely rose to that challenge. Looking at it, it’s hard to believe you never made meringue before. And the apricots look so fresh and juicy. Danielle we are so happy to have you baking along with The Cake Slice Bakers. Your cake looks absolutely stunning and the photos are just perfection. 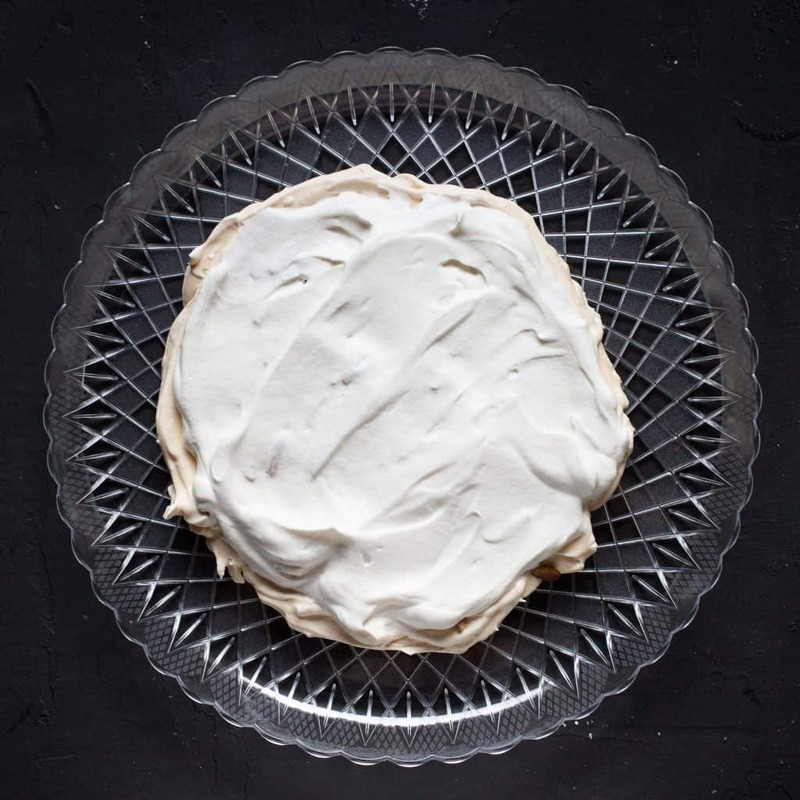 Meringue can be finicky and you made it look effortless. Thank you, Felice. Your submission for the month looks so tasty! I really love the idea of the lemon-sugar crackle on the frosting. It’s a good thing I bought the cookbook so now I can make that one too! Welcome to The Cake Slice Bakers, Danielle! And what a great bake to start with – the photos are beautiful and the result looks fantastic. Thank you so much, Susan. Your lemon buttermilk sheet cake looks divine! Your cake looks so yummy! I can’t wait to give this recipe a try. Welcome! WOW this cake is a show stopper! Looks absolutely delicious and I love the flavors combination! Thanks so much Natalie! It’s way simpler to put together than it looks.